The other day, we discussed the direction in which buttonhole stitch is worked, and I demonstrated that the direction you move with your buttonhole stitching can change the look of the buttonhole stitch. Well, the same principle is true with bullion knots. The direction in which you wrap the knot makes a difference in the way the bullion knot looks. Now, this isn’t to say that wrapping in either direction is wrong; rather, that stitchers should be aware of the difference in direction in which they wrap the knot, and if their bullions are coming out looking different from each other, the difference may very well be due to the direction in which the thread is wrapped around the needle. Keep in mind that sometimes, you want one result or the other in your bullions. A few photos will demonstrate this. 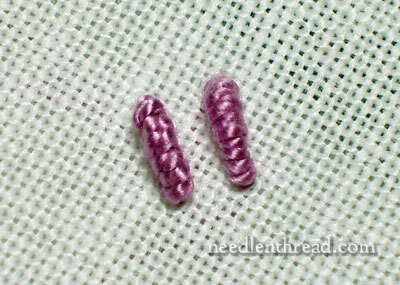 The embroidery thread that I’m using in these photos is perle cotton, which is an s-twisted hand embroidery thread. You may wish to read a little bit about the differences between s-twisted and z-twisted embroidery threads, and take a look at the photo comparison between stitching with an s-twisted and a z-twisted thread, to get an idea an idea of the differences between the two types of thread if you aren’t sure what I’m talking about or would like to know a little more about it. And if you’re not familiar with the bullion knot and how it is made, you are welcome to take a look at my bullion knot video tutorial or to consult any number of stitch dictionaries that may help you see how the stitch is formed, step-by-step, as this is not actually a tutorial on how to make a bullion. 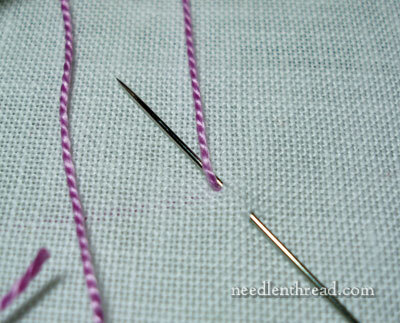 I’m using a milliner (or straw) needle here, which is the ideal needle for making bullions. In making the stitch in the photo above, I’m wrapping the thread clockwise around the needle, or in this case, with the needle pointing up in the fabric, I’m wrapping to the right as the thread passes over the needle. 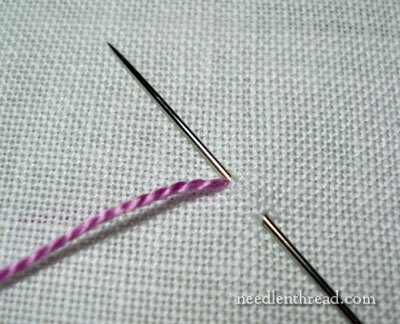 As the thread wraps under the needle, it is going to the left. 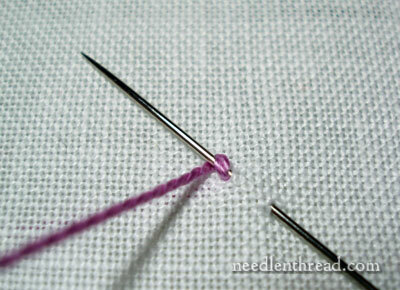 The thread is wrapped around the needle the required number of times to make the bullion knot the length you want. Keep an eye on the working thread. It’s looking pretty healthy in its twist, right? If you look at the thread at this point (where the arrow is pointing), you can see that it is maintaining its twist. The bullion knot in the photo above is the one created in the steps of the previous photo. And now I have the needle in position to start another bullion, but this time, I’ll wrap in the other direction. So now, I’m wrapping counter-clockwise, passing the thread under the needle to the right…. … and over the needle, to the left. As the thread is wrapped around the needle, notice what’s happening to the working thread. The twist is stretching out and the thread is losing its tighter twist. The knot on the left is not quite right because I pulled too tight at the end, ending up with a tapered knot… though sometimes, a tapered knot might be what you want (for certain types of flower petals and so forth). Still, aside from the difference in the overall shape, you can also see that the threads wraps look different. The knot on the right, which untwisted the thread as I worked it, looks like it has more wraps on it (it doesn’t) and overall, looks smoother. The knot on the left, which kept the twist of the thread, shows more definition of the perle cotton. 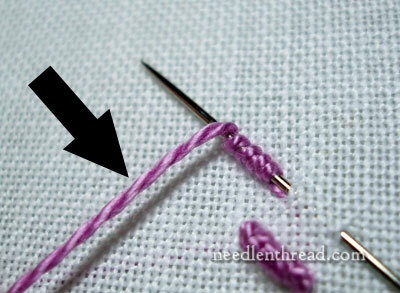 Now, if you are working with a z-twisted thread, to get either look (the right knot or the left), you’d have to twist the thread in the opposite direction shown above – because this is just one more proof that there is a difference in the outcome of the stitch, depending on the type of thread you’re working with! So the question is, what look do you want in your bullions? Do you want a smoother, softer look? Or do you want a well-defined wrap? It’s really up to you! Changing the direction of the wrap is an interesting way to achieve a varied look in your bullion roses, flowers, and whatnot! Try it! Play with bullions and see which direction of wrapping you like best, or how you can combine the two to create a subtle difference within an element made up of bullions. And now, your turn! When you make bullions, which direction do you automatically wrap the thread and why? Or is it something you’ve never really thought about? And who would blame you?! It’s a tough stitch to get consistently right, and it takes practice to make beautiful bullions! A bullion’s a bullion – why complicate things?!? (Go ahead! You can say it!) Feel free to leave a comment with your thoughts! Thanks for your comments on the Bullion stitch. Since I watched your video on the rose bud I have made several of them but I have difficulty pulling the thread through the needle after wraping around the needle. I realise I’m using the wrong needle. I’m going to invest in straw/millner needles but I need to know what size to buy or can I use any size. I never thought of direction when I wrapped my bullions. I will certainly pay closer attention to both my threads and the direction wrapping in the future. I love doing bullions but never liked the inconsistency of the results. Thank you for a good lesson. I can’t even manage to do a french knot after 10 years of cross stitching, I always take the cheats way out and use seed beads. Some how I pull the knot the whole way though or it just doesn’t knot! I would love to master embroidery knots, I have the A-Z Embroidery Stitches book and they have beautiful bullion knot variations. I just wanted to say how much I enjoy and appreciate your information. I only found your site a week ago and can’t wait to read your daily posts. Keep up the great work. The biggest problem I have with bullion is finding the dratted milliner’s needles! Either I order online (which I loathe doing for something so low in price, which leads me down the dangerous road of browsing the whole needleworking site LOL!) or go without. Without can be quite the challenge…ideas? I’ve always wrapped clockwise, I’ve never used Z twisted threads, and I haven’t made enough Bullions to make me a “Bullionere”. I need more practice and a straw needle because up until I started reading your blog, I never knew you should use a different type of needle when you make Bullions! 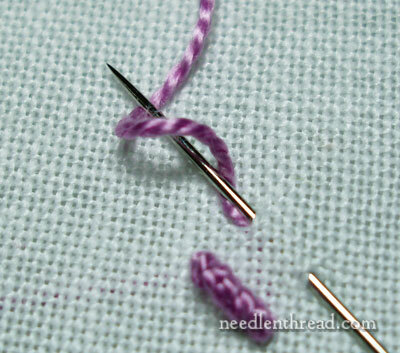 Now you’ve added S and Z twisted threads and wrapping in two difference directions. Geez. Now it’s up to me to practice, practice, practice. Thank you Mary. I’ll be a “Bullionere” before you know it. Well, I have to admit to doing it the second way……….but I thought that was clockwise? ?So, I am a dumb blonde. I also wonder if I prefer doing it this way, as I am right handed and it just feels a more natural way for me to do it. Have to say practice makes perfect with bullions, I have just finished doing 75 of them for a little handbag I am in the process of making. Will be interesting to learn which is the favoured way around and why. Thanks for sharing. This is helpful in that it shows a blunt & sturdy looking petal and a satin delicate petal. What a difference! Good morning, everyone! Thanks for your comments! Marysia! Funny – I always have to pause and think about clockwise and counter-clockwise when it comes to wrapping the thread. See, it makes a difference if your needle is pointing upwards towards the top of your fabric, or downwards, towards the base. I think. There I go again, pausing and thinking…. Brenda – thanks for the chuckle. I never thought about being a “bullionere” but it sounds like a good plan to me! You know who makes beautiful bullions is Yvette Stanton. She’s currently working on a book on Portuguese embroidery, which involves lots of bullions, and the sneak peeks she’s given of her samples are really stunning! Ah – Pam – the question of finding milliner needles. I usually buy needles in “bulk” (a large order at a time) through Colonial Needle, every couple years or so. I lay in an estimated supply of what I will need for my own work and what I will need for students’ work, when I have a class in the offing. Another place I’ve found milliners lately is quilt shops, in their notions sections. Not JoAnn’s or chain stores like that, but local quilt shops. And pretty much, in the two or three I’ve been to in the past year, all of them have carried milliners. So it might be worth looking at a local quilt shop that has a variety of notions available! You can use a crewel needle for bullions, but you have to do a little loosening up of the thread to get the eye through… and this often leads to tapered knots, because they tighten up towards the base sooner than they do in the middle. Thank you, Eileen! I’m glad you’re enjoying it! Hi, Fiona! Making French knots is a lot like learning to ride a bike. Once you “get it”, with a little practice, it becomes easy and effortless…. unless you happen to be going uphill, at which point my analogy about the bike limps a bit! The A-Z bullion book is great! I love all the different motifs in there – besides the flower! The clowns, bears, bees, so forth…. Hi, Anita – The best bet for purchasing milliners is to get a pack that has a range of sizes in it, from 3-9. That way, you have your bases covered. John James makes a combo pack like that, which they carry at Colonial Needle (www.colonialneedle.com). Just search “milliner” and you’ll see everything they offer in the way of milliner needles. The size of the needle depends upon the size of the thread you’re using, so for heavier threads, you’ll want the lower-numbered sizes, and for finer threads, the higher-numbered sizes. Thanks, Cathy – glad you like the tip! Ok, I’m off to work. Ice and snow here in Kansas, after a beautiful 70 degrees yesterday! Enjoy your day! Well, it’s going to be a rainy day here today so I think you’ve inspired me to work on buttonhole and bullion stitches in different directions. I’ve never really given it much thought on direction but I will add some today to my crazy quilt. Thank you. I have never even thought about what way to twist the thread on a bullion just did it whatever way but looking at your examples I can clearly see what a difference it makes. I am learning so much from your site. I am embroidering a baby blanket and using mostly stem stitch, in part because I love the way it looks in the back. I have a question I haven’t come across. How do you start and finish tiny areas of say just a few French knots that are not close to other stitching? Thanks so very much for this one. It was helpful, informative and your use of pictures keeps me “tuned-in” every morning when I first arise and start to toddle around in the (yes…still !) Pittsburgh snow. I haven’t tried bullions yet but want to. The blog you did on “S” twist and “Z” twist has been very helpful to me. And I can see where it would make a huge difference in bullions. The second one to the right kind of reminds me of a bug. I like the one to the left better. I wonder how much difference the twist would make in French knots. I remember thinking you wrap your thread the opposite of the way I do it. But then it didn’t seem to matter that much. I may have to play with that, see if the right wrap makes a neater French knot, like a tiny rosebud. Thank you very much. This really help. I use my left hand to twist the thread on to the needle,from left to right, I love these knots. Never thought of twisting the thread the other way, I should try it.Someone mentioned to me that Braziliam embroidery, uses this technique a lot in their beautirul work. Good article and demonstration of the wrap direction of a bullion with S twist and Z twist thread. We seem to have a different way of calling a wrap clockwise or counter clockwise. Those of us who do Brazilian embroidery always tell our students to wrap clockwise with Z twist, explainiong that if you are looking at the point of the needle the thread wraps around like the hands go around the clock. This is what you called counter clockwise. Oh my, I just stumbled over this site while resarching blackwork for a funeral pall that I am about to embroider and what riches have fallen into my lap. As a young embroiderer, this is such a treasure. Thank you for sharing patterns, wisdom and techniques. I am self taught from books and exerimentation (and from Inspirations magazine) but there is so much still to learn! It is a big project, though luckily it is not a full sized funeral pall, but a cremation pall. Still, it is the first time I am tackling a project this big. Thank you for the well wishes! Thank you Mary for revisiting the bullion stitch and blanket stitch. 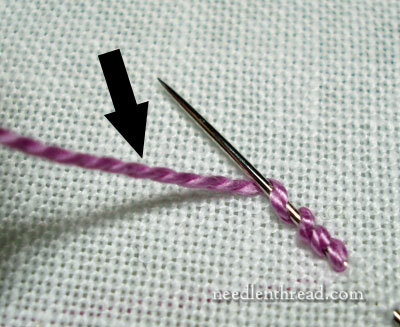 Your way of analyzing the directions of stitches and thread twist are so helpful. Diving into the more “nitty gritty” part of embroidery details is very interesting and becomes a very useful tool. Thanks for taking the time and sharing it …. Knowing myself, if something doesn’t look ‘right’ to me, I’m more than willing to frog. and frog. and frog. I appreciate all the you are sharing and teaching on this site, Mary! Thank you! Thanks for the insight – I see now one of the reasons my knots are inconsistent. 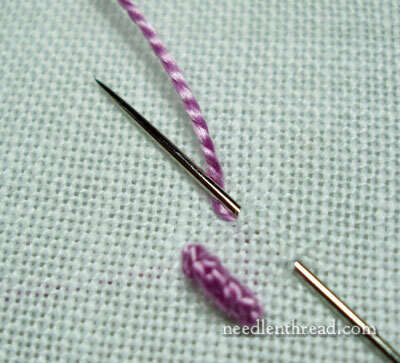 I the other problem I always have is pulling the needle through while keeping it wrapped. Any suggestions for that? As always, I enjoy your writings and always learn something! This is really helpful. I wasn’t entirely satisfied with the bullions I made in a recent piece (the first time I’d tried them), but I didn’t know why. I wonder if I’d have liked them better in another direction. Of course I’ve given the piece away, so I’ve no idea how I did them, but at least I’ll know to experiment next time. I was wondering about the fabric you are using on these photos and what count? Thanks for the info Mary … it sure is beautiful and caught my eye. Mary! I find your discoveries with stitch fascinating – I’ve taught stitch for 20 years and I’m still learning (from smart folk like you!). I just wanted to let you know that I lived in Kansas with a wonderful family in Winfield (I’m English and I was an exchange student 30 years ago). Ironically, I visited last summer and stayed with my US host family at their homes in Winfield and Wichita. I’m coming to see them again in 2012 with my English mum, we’re planning to go to the Bluegrass Festival. It’d be great to come and see you at the same time? I have a different way to name the directions I would call the direction of the second bullion clockwise – the direction the clock hands work (here considering the needle the center of the clock) make this any sense??!! Thanks for the vote of confidence Mary! Your website is my special “escape” for the day. When my baby is sleeping I pop in for a visit to see what you’re up to. It gives me a sense of self to be reading/seeing the things that I enjoy (that aren’t baby or housework related!) I know you’re a busy lady, but I wish you had more stitching time because I just love watching your projects unfold! The pomegranate and the jacobean jumble have me fascinated. I just don’t know how you look at a pattern and “see” what colours and stitches you want to use. Do you have a creative process? I would like to be able to unlock a little creativity in myself-I am great at following patterns and instructions, but not so good at using my own imagination! I just wanted to mention to Fiona and others what I have found with French knots. Like Fiona, I always had trouble making them, especially since I often use perle cotton, which is slippery. I then stumbled on a stitch dictionary with the Colonial knot, which is very similar and, I think, easier to do. I usually use that now with the cotton, but I have found that I seem to have no trouble making French knots with wool thread. I love your site and thank you so much for putting so much time and love into it. Your style is perfect for learning the right way to do things. Have you ever been to the Royal School of Needlework? What I would give to be able to take classes there! Hi. I stumbled upon your site while looking (in vain) for an ebay item that I wish I’d saved. Have you ever done that? Seen something so beautiful and breath-taking, and thought, oh, I’ll just go back to it? And now it’s gone. Can’t find it on ebay, have googled ebay, etc. and now am reduced to looking online for something similar. Anyway, it was a gorgeous white on white, vintage, probably French embroidered piece. What was so astonishing is that it had a floral motif, which I don’t usually care for, but the work was so realistic, yet so artistic at the same time. The rose had petals which were tapering bullioned stitch, with such mastery yet such abandon. I’m sure it was padded, because the work was three-dimensional. OMG, what I wouldn’t give to find that piece again. But of all the people I’ve seen on the internet, you look like you’d be the person who would know about it, or be able to reproduce that stitch. It was so so so so fine, and so is your work. Hi, Nancy! Thanks for your comment! Yep, I’ve done that too many times to count! I’m not sure of the piece you’re talking about, though. There are so many things that come and go online, it’s impossible to really know all of them. Are you looking for another vintage piece that you want to purchase, already stitched, or are you looking for the design to stitch yourself? I’ll let you know if I stumble on anything that sounds like what you’re talking about! Hi, Nancy – OH WOW. The sheet is gorgeous. What a work of art! Slightly out of my price range, but so far, I think the bid is reasonable. It’s really beautiful! I’m about 3 hours west of KC – not “too far” from the city to enjoy a day there now and then, but far enough that driving to the airport is a Pain in the Neck! 🙂 I’m not giving classes currently – a little busy with the school year – but I may start them up again in the future. If I do, I’ll announce them! You’re right – there is a lot of Kansas and a lot of MO between KS & MO! What part of Missouri are you in? Have you considered looking up the EGA (Embroiderers Guild of America), and seeing if there is a chapter nearby? They often host classes with excellent teachers! I live near Holt, Missouri, which is about an hour north of Kansas City (depending on the traffic). I could get in touch with the EGA–thanks for the suggestion! Now you see what I mean about the work, since I’m guessing by your reaction that you saw the ebay site:-) And I consider that only less than half of the craftswomanship of the one I really love, and can no longer find. Thanks so much for sharing your love of the material and the craft with the rest of us, Mary. What a gift! I love your pomegranate embroidery, by the way. Don’t mean to tie up your band-width here, Mary, but here’s another url that I thought you might enjoy. Maybe you could change one of the Ms to a C? You are right. 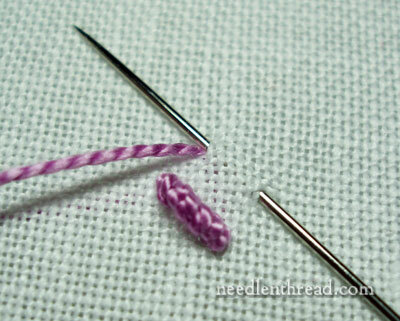 This stitch is going to take a lot of practice to get just right. 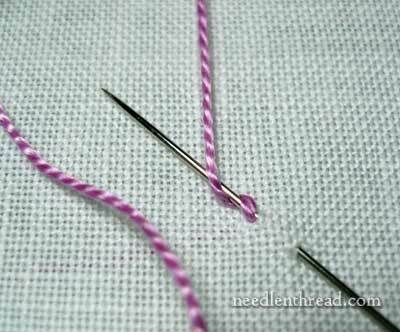 I’m wondering if it is possible to do this stitch using two or three strands of embroidery floss? Oh yes, you can work it with practically any type of thread. Three strands of floss look great! Your videos are so easy to follow. I will be using the techniques in Needlepoint. Thank you. I am looking for a bullion pattern to make giraffes. Do you have any websites I could check out for this please. Thanks. Next Next post: Wool Embroidery Project: Perspective is Everything!